Business and Society 9 Edition Learn to make strong business decisions with a better understanding of business ethics, sustainability, and stakeholder management from a strong managerial perspective. 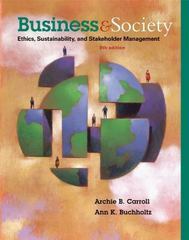 BUSINESS AND SOCIETY: ETHICS, SUSTAINABILITY, AND STAKEHOLDER MANAGEMENT, Ninth Edition, demonstrates how the most successful business decision makers balance and protect the interests of various stakeholders, including investors, employees, the community, and the environment--particularly as business recovers from a perilous financial period. The authors effectively balance strong coverage of ethics and the stakeholder model with an increased focus on one of business's most recent, urgent mandates: sustainability. Coverage highlights the connection between business and the natural, social, and financial environments, illustrating how all three must be maintained in balance to sustain current and future generations. New actual business cases, real applications, and today's latest business examples present you with specific business challenges that test your values and require you to focus your reasoning skills for ongoing success in today's workplace.